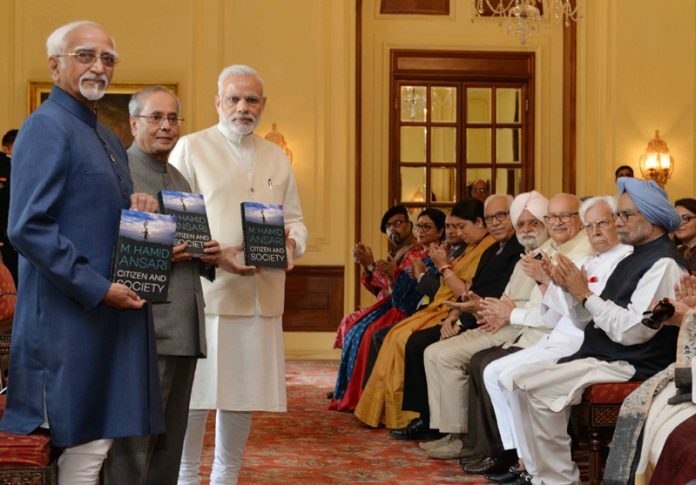 The President, Shri Pranab Mukherjee releasing the book Citizen and Society, authored by the Vice President, Shri M. Hamid Ansari, at Rashtrapati Bhavan, in New Delhi on September 23, 2016. The Prime Minister, Shri Narendra Modi, the former Prime Minister, Dr. Manmohan Singh and other dignitaries are also seen. New Delhi: The President of India, Shri Pranab Mukherjee released the book ‘Citizen and Society’ written by Vice President Shri Mohd Hamid Ansari today (September 23, 2016) at a function held at Rashtrapati Bhavan in the presence of Prime Minister Shri Narendra Modi. Speaking on the occasion, the President complimented Shri Mohd Hamid Ansari for bringing out the volume, which is a collection of Shri Ansari’s lectures on diverse themes. He said that he normally receives books but made an exception in this case because he has known Shri Ansari for many years not just as Vice President but as a scholar, diplomat and conscientious citizen of this great country. The President said when Shri Ansari took oath as the Vice President of the Republic for his first term, the media had asked whether he was ‘apolitical’. His response was that “No citizen is apolitical; as a citizen, by definition, has to take interest in public affairs”. The President said this was the theme of the book. The book reminds us of our responsibilities as citizens. 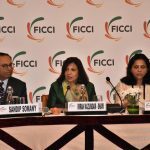 Democracies tend to be noisy and India is noisier than others but engagement with issues pays rich dividends for the citizens. Shri Ansari has, with great clarity and élan, drawn attention to this fact. The President said the marvel that is Indian democracy needs to be constantly nurtured by its citizens. Prime Minister of India, Shri Narendra Modi spoke on the occasion and complimented the Vice President on the release of his book. He said the world is changing and technology has transformed citizens into netizens. In the present context, we must preserve our traditions and family values which are our greatest strength. Speaking about his book, Vice President Hamid Ansari said his volume was a collection of lectures on diverse themes such as polity, security and empowerment. He said he has made an effort to probe the diversity of challenges that confront India. Other dignitaries present on the occasion included former Prime Minister Dr. Manmohan Singh, Smt. Smriti Zubin Irani, Union Minister of Textiles, Shri Vijay Goel, MoS (Independent Charge) Youth Affairs and Sports and Members of Parliament.